I have a dirty admission to make: I think yesterday happened. Actually. Objectively. Stuff happened. I hear that’s still a controversial statement in some corners of the humanities, but I can’t say for sure; I generally avoid those corners. And I think descriptions of the historical evidence can vary in degrees of accuracy, separating logically coherent but historically implausible conspiracy theories from more likely narratives. At the same time, what we all think of as the past is a construct. A bunch of people – historians, cosmologists, evolutionary biologists, your grandmother who loves to tell stories, you – have all worked together to construct and reconstruct the past. Lots of pasts, actually, because no two people can ever wholly agree; everybody sees the evidence through the lens of their own historical baggage. I’d like to preface this post with the cautious claim that I am an outsider explaining something I know less about than I should. The hats I wear are information/data scientist and historian of science, and through some accident of the past, historians and historians of science have followed largely separate cultural paths. Which is to say, neither the historian of science in me nor the information scientist has a legitimate claim to the narrative of general history and the general historical process, but I’m attempting to write one anyway. I welcome any corrections or admonishments. Narratives are important. In the 1970s, a bunch of historians began realizing that historians create narratives when they collect their historiographic research 3; that is, people tell stories about the past, using the same sorts of literary and rhetorical devices used in many other places. History itself is a giant jumble of events and causal connections, and representing it as it actually happened would be completely unintelligible and philosophically impossible, without recreating the universe from scratch. 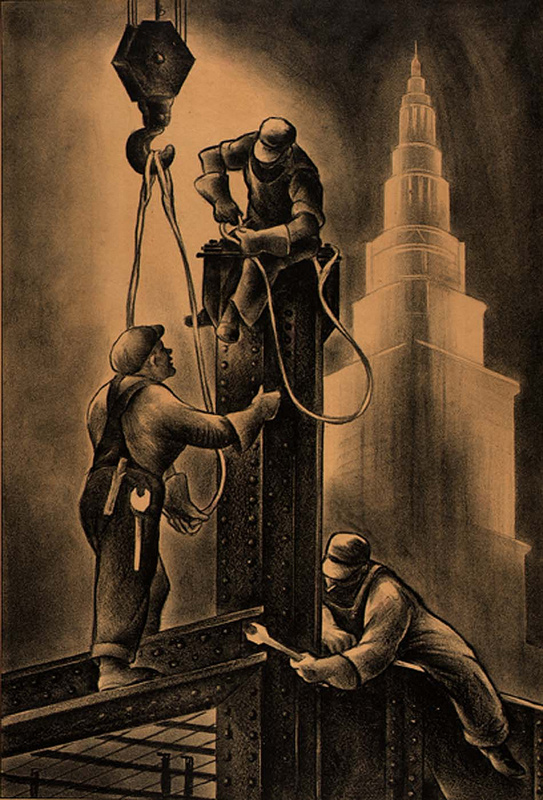 Historians look at evidence of the past and then impose an order, a pattern, in reconstructing the events to create their own unique historiographic narratives. The narratives historians write are inescapably linked to their own historical baggage. Historians are biased and imperfect, and they all read history through the filter of themselves. Historiographic reconstructions, then, are as much windows into the historians themselves as they are windows into the past. The narrativist turn in historiography did a lot to situate the historian herself as a primary figure in her narrative, and it became widely accepted that instead of getting closer to some ground truth of history, historians were in the business of building consistent and legible narratives, their own readings of the past, so long as they were also consistent with the evidence. Those narratives became king, both epistemologically and in practice; historical knowledge is narrative knowledge. Because narrative knowledge is a knowledge derived from lived experience – the historian sees the past in his own unique light – this emphasized the importance of the individual in historiographic research. Because historians neither could (nor by and large were) attempting to reach an objective ground-truth about the past, any claim to knowledge rested in the lone historian and how he read the past and how he presented his narrative. What resulted was a (fairly justified, given their conceptualization of historiographic knowledge) fetishization of the individual, the autonomous historian. When multiple authors write a historiographic narrative, something almost ineffable is lost: the individual perspective which drives the narrative argument, part of the essential claim-to-knowledge. In a recent discussion with Ben Schmidt about autonomous humanities work vs. collaboration (the original post; my post; Ben’s reply), Ben pointed out “all the Stanley Fishes out there have reason to be discomfited that DHers revel so much in doing away with not only the printed monograph, traditional peer review, and close reading, but also the very institution of autonomous, individual scholarship. Erasmus could have read the biblical translations out there or hired a translator, but he went out and learned Greek [emphasis added].” I think a large part of that drive for autonomy (beyond the same institutional that’s-how-we’ve-always-done-it inertia that lone natural scientists felt at the turn of the last century) is the situatedness-as-a-way-of-knowing that imbues historiographic research, and humanistic research in general. I’m inclined to believe that historians need to move away from an almost purely narrative epistemology; keeping in sight that all historiographic knowledge is individually constructed, remaining aware that our overarching cultural knowledge of the past is socio-technically constructed, but not letting that cripple our efforts at coordinating research, at reaching for some larger consilience with the other historical research programs out there, like paleontology and cosmology and geology. Computational methodologies will pave the way for collaborative research both because they allow it, and because they require it. This is a map of Paris. Map of Paris with dots representing photos taken and posted on Flickr. Red dots are pictures taken by tourists, blue are by locals, and yellow are unknown. via Eric Fischer. On top of this map of Paris are red, blue, and yellow dots. 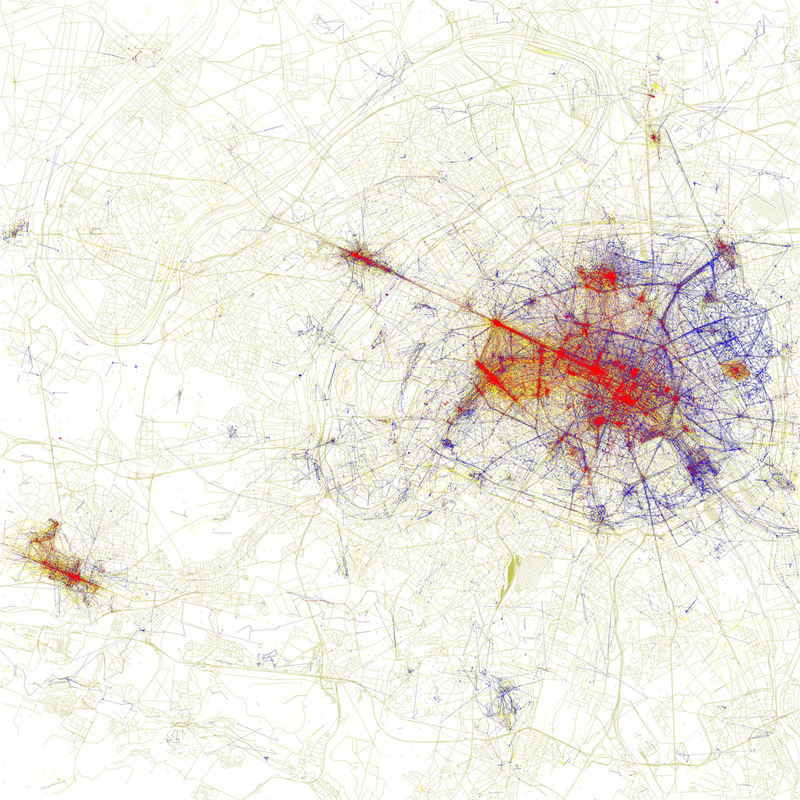 The red dots are the locations of pictures taken and posted to Flickr by tourists to Paris; blue dots are where locals took pictures; yellow dots are unknown. The resulting image maps and differentiates touristic and local space by popularity, at least among Flickr users. It is a representation that would have been staggeringly difficult for an outsider to create without this sort of data-analytic approach, and yet someone intimately familiar with the city could look at this map and not be surprised. Perhaps they could even recreate it themselves. What is this knowledge of Paris? It’s surely not a subjective representation of the city, not unless we stretch the limits of the word beyond the internally experienced and toward the collective. Neither is it an objective map 4 of the city, external to the whims of the people milling about within. The map represents an aggregate of individual experiences, a kind of hazy middle ground within the usual boundaries we draw between subjective and objective truth. This is an epistemological and ontological problem I’ve been wondering about for some time, without being able to come up with a good word for it until a conversation with a colleague last year. “This is my problem,” I told Charles van den Heuvel, explaining my difficulties in placing these maps and other similar projects on the -jectivity scale. “They’re not quite intersubjective, not in the way the word is usually used,” I said, and Charles just looked at me like I was missing something excruciatingly obvious. “What is it when a group of people believe or do or think common things in aggregate?”—Charles asked—”isn’t that just called culture?” I initially disagreed, but mostly because it was so obvious that I couldn’t believe I’d just passed it over entirely. In 1976, the infamous Stanley Milgram and co-author Denise Jodelet 5 responded to Durkheim’s emphasis on “the objectivity of social facts” by suggesting “that we understand things from the actor’s point of view.” To drive this point home, Milgram decides to map Paris. People “have a map of the city [they live in] in their minds,” Milgram suggests, and their individual memories and attitudes flavor those internal representations. A city is a social fact. We would all agree to that. But we need to add an important corollary: the perception of a city is also a social fact, and as such needs to be studied in its collective as well as its individual aspect. It is not only what exists but what is highlighted by the community that acquires salience in the mind of the person. A city is as much a collective representation as it is an assemblage of streets, squares, and buildings. We discern the major ingredients of that representation by studying not only the mental map in a specific individual, but by seeing what is shared among individuals. Which brings us back to the past. 6 Can collaborating historians create legitimate narratives if they are not well-founded in personal experience? What sort of historical knowledge is collective historical knowledge? To this question, I turn to blogger Alice Bell, who wrote a delightfully short post discussing the social construction of science. She writes about scientific knowledge, simply, “Saying science is a social construction does not amount to saying science is make believe.” Alice compares knowledge not to a city, like Paris, but to a building like St. Paul’s Cathedral or a scientific compound like CERN; socially constructed, but physically there. Real. Scientific ideas are part of a similar complex. The social construction of historiographic narratives is painfully clear even without co-authorships, in our endless circles of acknowledgements and references. Still, there seems to be a good deal of push-back against explicit collaboration, where the entire academic edifice no longer lies solely in the mind of one historian (if indeed it ever had). In some cases, this push-back is against the epistemological infrastructure that requires the person in personal narrative. In others, it is because without full knowledge of each of the moving parts in a work of scholarship, that work is more prone to failure due to theories or methodologies not adequately aligning. Building historiography together. via the Smithsonian. I fear this is a dangerous viewpoint, one that will likely harm both our historiographic research and our cultural relevancy, as other areas of academia become more comfortable with large-scale collaboration. Single authorship for its own sake is as dangerous as collaboration for its own sake, but it has the advantage of being a tradition. We must become comfortable with the hazy middle ground between an unattainable absolute objectivity and an unscalable personal subjectivity, willing to learn how to construct our knowledge as Parisians construct their city. The individual experiences of Parisians are without a doubt interesting and poignant, but it is the combined experiences of the locals and the tourists that makes the city what it is. Moving beyond the small and individual isn’t just getting past the rut of microhistories that historiography is still trying to escape—it is also getting past the rut of individually driven narratives and toward unified collective historiographies. We have to work together. Milgram, Stanley. 1976. “Pyschological Maps of Paris.” In Environmental Psychology: People and Their Physical Settings, ed. Proshansky, Ittelson, and Rivlin, 104–124. New York. There’s serious danger I’m being boxed in to an untenable position here. But it’s an interesting one, so let me stretch out and see how it feels. I’m putting it into your comments instead of my blog to indicate I’m not sure I believe it. Basically I’ve been saying that we need to study collective organizations—as you suggest with Paris—but that the optimal social arrangement is individuals because of certain problems with collaboration. I’ve only sketchily described what these might be, and partly simply appealed to traditional norms about what ‘the humanities’ are. (Somehow, as frequently happens in these cases, no one has mentioned the phrase ‘social science,’ a lever either of us could pull to interesting results.) You’re basically saying that if we value accuracy in research, there are almost no cases where individual as opposed to collaborative researchers can handle the multiplicity of perspectives to understand those organizations. One place where my view might spin into absurdity pretty quickly is on the question of whether the status quo is defensible. It’s not at all clear to me that we should have academic historians at all, or anywhere near the number we currently do. Keep the museums open, have Taylor Branch keep writing his books, and we might be fine. A relentless focus on churning out research for specialist audiences that insists on its novelty at the expense of public engagement might be one of the biggest problems facing history. In that sense, we are already too much like the sciences; and if the promise of collaboration is consilience, that seems like the wrong direction to go in. First of all, Ben, let me thank you for this fantastic dialogue. I’m not entirely convinced of or certain about my position either, but this feels like the best way to figure it out. I would like to apologize for being unclear regarding the understanding of a multiplicity of perspectives. I absolutely do not feel it requires a collaboration to understand multiple perspectives, I was just using those two parallel tracks to suggest they share many similarities: socially understanding phenomena, and socially creating phenomena. I do share your skepticism regarding the difficulty of collaboration without infection. We need to be careful to avoid the colonization of physics and statistical mathematics in the humanities, as they appear to have done in so many other disciplines. Scott– as you mention above, professional history is already collaborative, but in a way that mystifies the temporal and social relationships underwriting the work. I don’t want to write a defense of the individual author fetish, or of strict narrativity, because I don’t see them as essential. But, I do think that the lived working experience of archival historians is, in part, at the root of what you’re grappling with. The historian’s archive, which when the discipline was young was an early modern and medieval archive, demands solitude and individual expertise. It’s also a sacred space. One goes there on pilgrimage, a sojourn in search or revelation and ecstasy. That archive is disappearing, and the discipline hasn’t caught up to it yet. As the archive changes, so to will the rest. And also, I’m not a social scientist. And, I don’t want to be one. I’ve actually used the very same Eric Fischer visualizations a number of times in talks. But where you have used them to evangelize for a kind of historiography that you don’t think is happening yet (at least not enough), I used them as a metaphor for historiography as I think it’s already been happening for a long time. History … begins not with the collection of isolated particles of data, nor with a universal doubt, nor with a blank and empty consciousness, but with a homogeneous world of ideas. No other starting place is to be found, none other is possible … the process in historical thinking is never a process of incorporation; it is always a process by which a given world of ideas is transformed into a world that is more of a [coherent] world” (Experience and Its Modes, 98–99). The historian presents her concepts through a written narrative or some comparable historical product, but she does not ﬁrst develop her concepts and then present them; the presentation is part of the development. And the historian develops her concepts partly in response to the concepts presented by other historians who produced interpretations of the same subject. Ryan, your points are well-taken; history is enmeshed in a culture of presentation and collaboration, and has been for some time. And digital work *certainly* can be isolating. Still, I have to second what Chad said in the previous comment, that while “professional history is already collaborative, [it is so] in a way that mystifies the temporal and social relationships underwriting the work.” We’re collaborative without really acknowledging that collaboration, and because of this lack of acknowledgement, a co-author still apparently receives less credit for a paper than if she’d authored it alone. My issue and argument isn’t so much that we now should and can collaborate in ways that we couldn’t before (although I do think that door is opening), but that stated collaboration shouldn’t be second class in our culture and our epistemology. Thanks for the conversation. If you guys haven’t read it before (or even if you have!) I think Roy’s essay Can HIstory be Open Source does a nice job of parsing through a lot of the similarities between writing in history and the sciences and in the shape of collaborations.